Monthly Review receives a substantial and steadily increasing amount of daily correspondence from readers, and it is not always possible to answer all of these messages in a timely manner, especially as many pose questions that warrant careful reflection. However, we very much welcome hearing from MR readers. We will continue replying to all letters as expeditiously as we are able. 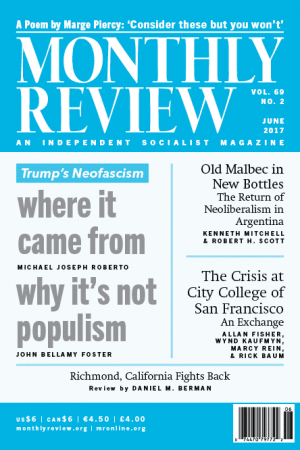 On occasion, when we think comments on articles would generate a useful exchange, we publish them in the magazine under the heading Correspondence, as is the case with the discussion in this issue of Rick Baum’s article “A Teacher’s Union Against Itself,” from the April 2017 MR.
I’ve been reading Monthly Review for about 50 years, and now at age 74, I’m getting a little tired of hearing MR editors and authors announce “Capitalism’s Final Crisis,” as in the subtitle of one of your current books. As a specialist in U.S. and Latin American History, I have never seen capitalism’s grip over the world’s people stronger than it is today. You had me convinced on other occasions, but I just can’t see the “final crisis” now. The left suffers one defeat after another. Do you conflate what capitalists worship as “creative destruction” (preferably at the expense of the poor) with systemic crisis? This is an important question, and deserves a considered answer. The book to which Bollinger refers is John Smith’s pathbreaking work (and winner of the Paul A. Baran and Paul M. Sweezy Memorial Prize) Imperialism in the Twenty-First Century: Globalization, Super-Exploitation, and Capitalism’s Final Crisis. Smith argues that the world is currently caught in a global conjuncture dating back to 2007 that is “not just another crisis of capitalism. It is a crisis of imperialism.” However, his main reason for calling this the “final crisis” is that it coincides with the crisis of the planet, meaning that there is no way out of this crisis of imperialism for the system. Smith writes on the concluding page of his book: “The capitalist destruction of nature means that this is not just capitalism’s greatest-ever crisis, it is capitalism’s final crisis, an existential crisis for humanity” (314-15). Smith’s book in this respect can be seen as overlapping with another important work, Del Weston’s The Political Economy of Global Warming: The Terminal Crisis (Routledge, 2014)—to be reviewed in a forthcoming issue. Weston addresses some of the same issues of imperialism and super-exploitation as Smith, but sees these contradictions within the larger crisis of the Anthropocene. Capitalism, she argues, has brought us to a giant impasse, a “terminal crisis” of human society, which only a movement toward socialism can transcend. As she puts it: “The future holds only two possibilities: First, ecological destruction; the second, radical, systemic, transformative, epochal change” (197). We think Bill Bollinger is entirely correct in saying that the left has experienced a series of defeats and that the grip of capital has tightened. The recent reversals in Latin America are a warning. Creative destruction has turned into an all-pervasive creative destructiveness. We live in an age where a new era of revolutionary social change, unlike any that came before it, is the only hope—not just for ourselves but for the chain of human generations. Moreover, our analysis suggests that this is not just a vain hope: there will be struggles on a revolutionary scale, emanating from the bottom of society, though when and where they will emerge is not clear, nor of course their final outcome. In April 2011, Monthly Review published an article “Monopoly and Competition in Twenty-First Century Capitalism” by John Bellamy Foster, Robert W. McChesney, and R. Jamil Jonna, later included as a chapter in Foster and McChesney’s The Endless Crisis (Monthly Review Press, 2012). The essay contained empirical estimates of concentration in U.S. industry, showing as well how profit margins were rising among the largest corporations. At the time, growth in economic concentration and its association with higher gross profit margins were generally denied altogether in economics. The MR article therefore came as a shock to many and was widely cited, including in articles in the New York Times by Nancy Folbre (“Who Rules the Global Economy?” November 7, 2011) and Paul Krugman (“Barons of Broadband,” February 16, 2014, citation in the online version). Industry Week ran a special feature (“Is Manufacturing Industry Consolidation Stifling Competition and Innovation?” June 13, 2015) that took the MR article of four years earlier as its springboard. This was followed by a major consideration of concentration in similar terms in the Economist (“Business in America: Too Much of a Good Thing?” March 26, 2016), which, while it did not mention the article, analyzed the data using methods similar to those introduced in MR.
After the war, Milton was a union organizer with the CIO. Facing a blacklist in the McCarthy era, he moved to San Francisco, where he completed his B.A. at San Francisco State University and married Nancy Dall. Together they traveled to the People’s Republic of China, where they taught English and met Mao Zedong and Zhou Enlai. After returning to the United States, they wrote The Wind Will Not Subside: Years in Revolutionary China, 1964–1969, which was a New York Times notable book. Milton received a PhD in Sociology at the University of California, Berkeley, and in 1978 became a professor of sociology at the University of Oregon. Various MR authors who have passed through the university—including John Bellamy Foster, who continues to teach there, and on whom Milton had an enormous impact—were all influenced directly or indirectly by Milton’s scholarship and his lifelong commitment to the left and to humanity as a whole.